My wife, Christine, and I are both from the same small town in southeast rural Wisconsin. In both of our families, we each are among the few that have left the area. We had always planned on having a small family and moving back to our hometown again some day. Many years ago now I started scouring the property real estate market back there for a nice chunk of our hometown's woods and hills. I found one a couple years ago that suited our needs, and we bought it. Over the years I have slowly begun to clear the land and do the research of what will work to eventually build a small country home there. After our first-born son's battle with childhood cancer, Christine and I felt the pull to our hometown and our families begin tugging at our heart strings more then ever. The timeline accelerated, and before I knew it I was calling a hometown life-long friend, who is a general contractor, to help me get ready to eventually build a house on the property that I was still a long ways away from having cleared. I had to rush a bit to finish my latest home remodel project in Ogden, Utah to get everything in order. I managed to wrap that up pretty quickly with the help of a really good local mud and taper. Just as the heat of the Utah summer was really starting to come on we packed up and hit the road back to Wisconsin. However, we aren't moving back this trip. We are just beginning the process of doing so over a period of time now with intention. With my line of work in the winter it takes a certain amount of strategy to pull off a life in which my family would be base camped in a rural corner of Wisconsin. A corner rather far removed from the mountain ranges of America. 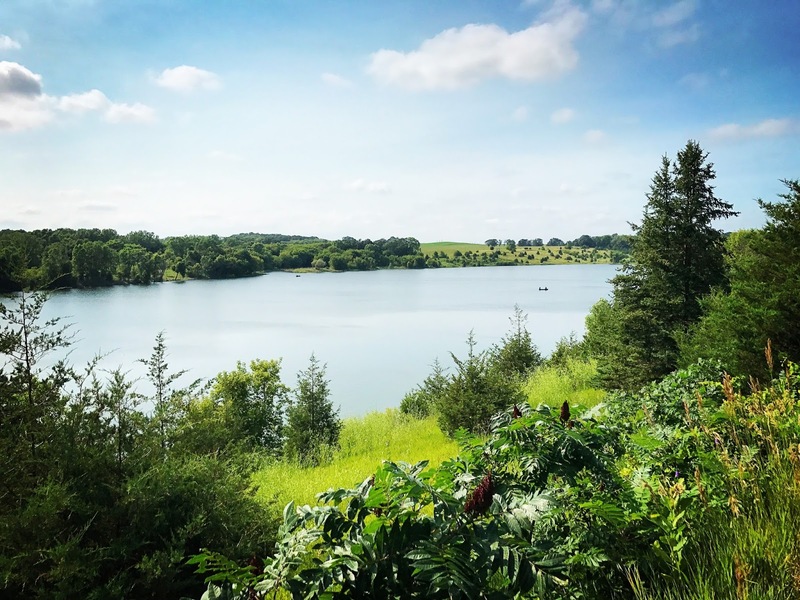 As such, we planned be in Wisconsin for a few months as I work the property as well as the local outdoor recreation market that is growing rapidly in the area. I am launching a new website and guide service there for the local outdoor recreation. I have a lot of work to do to get ready for this adjustment in home base, but my wife and I have a plan. 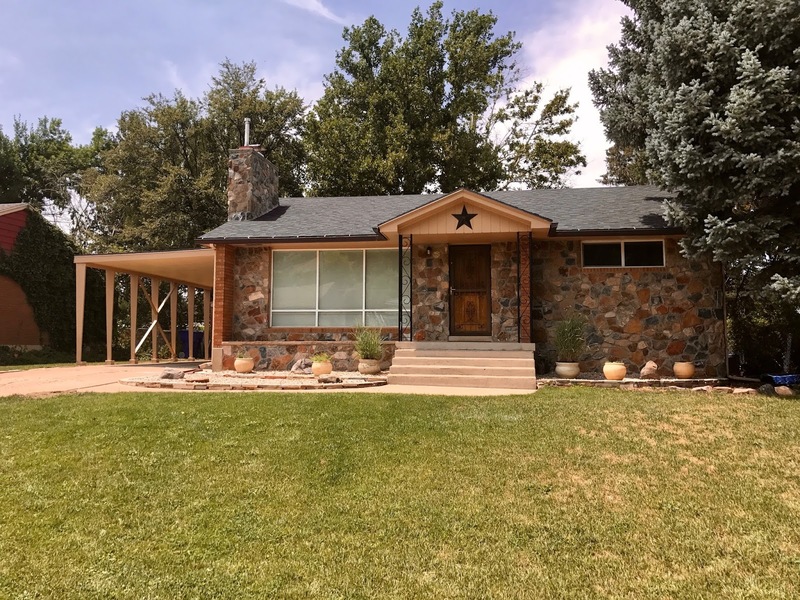 We'll be returning to Utah for winter as I will need to shore-up all of my winter business and rental properties there to also be ready for the new home base. At one point in our discussions my wife said to me, "You are gone all winter long in mountains around the world all winter. What difference does it make if you are traveling from Utah, or traveling from Wisconsin." She was right. It hadn't occurred to me, but with a Snowbasin season pass with just 30 days on it come close of this season I realized that I was indeed traveling to vast mountain ranges everywhere else in the world to an extent that my family was at home in Utah without me rather often. Also without the kind of support our families in Wisconsin could offer my wife and our kids. So that's the plan. 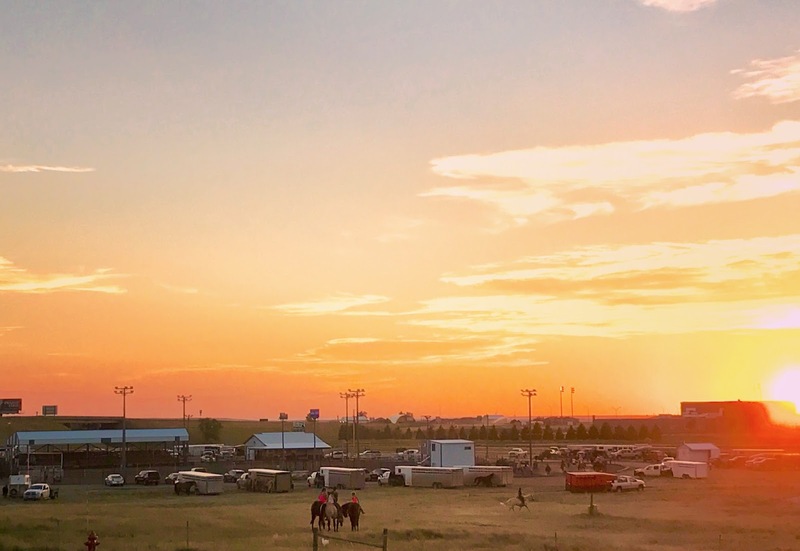 We were set to head back across the Great Plains to our hometown for a few months to clear land, and build up an outdoor recreation website and guide service there. Then we'll be cruising back again to Utah for the winter to shore-up all of my winter work in order for me to get ready to be able to continue to work in mountain ranges around the world all winter long while my family is home-based in a small country home on a tract of woods, hills, and wetlands in our little rural corner of Wisconsin. With the plan in place, my latest Ogden remodel set-up, and the work all laid out before us. The time had come to begin the march. evening with our friends the Geigers in Ogden. After dinner and laughs with his wife, Heather, and the kids my good friend, Ben, the patriarch of the clan, took Christine and I out for a mountain bike ride on the stretch of the Bonneville Shorline Trail local to his end of the Ogden range above his house just north of Ogden City. Heather looked after all the kids while Ben, Christine, and I rallied the trail. ^Despite one close call with a rattlesnake we had an absolutely beautiful sunset ride on the mountain bench above Willard Bay. In this picture above Christine is rounding a turn as the sun begins to dip behind the mountains just west of the bay. It was fitting for Ben and his family to give us a send off for the summer on this journey as he was among one of my very first friends in the area almost twenty years ago by now. 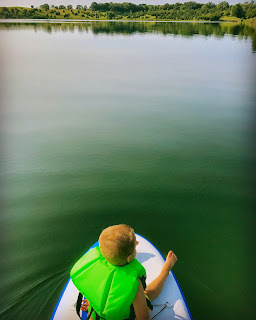 I will miss my buddy this summer and fall, but I will see him again soon for the ski season that looms just around the corner. ^Our family pic on a hike above Ogden City just before we packed up our van to venture the big drive to Wisconsin. 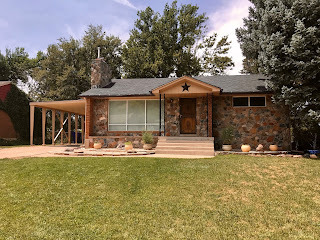 ^This is a picture of the front of the remodeled house I had to wrap up in Ogden City. This is also the place we will come back to again for the winter. It had to really work it to get this place ready for being away from it for months on end, but we also were fortunate to land a really great care-taker tenant to stay there and care for the place while we're gone all summer and fall. She is a friend of ours that just so happened to be in between homes at the exact moment we were looking for a solution. I couldn't have asked for a better person to watch the home I have poured so much blood and sweat into in remodeling. With that we were off onto the great wide open road. 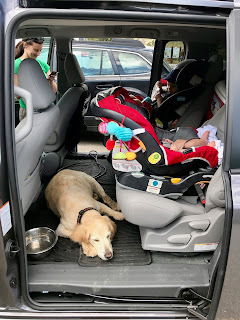 I put together a route to make use of a lot of cool places along the way, as well as make the long road trip more tolerable on our two young sons, and old dog. 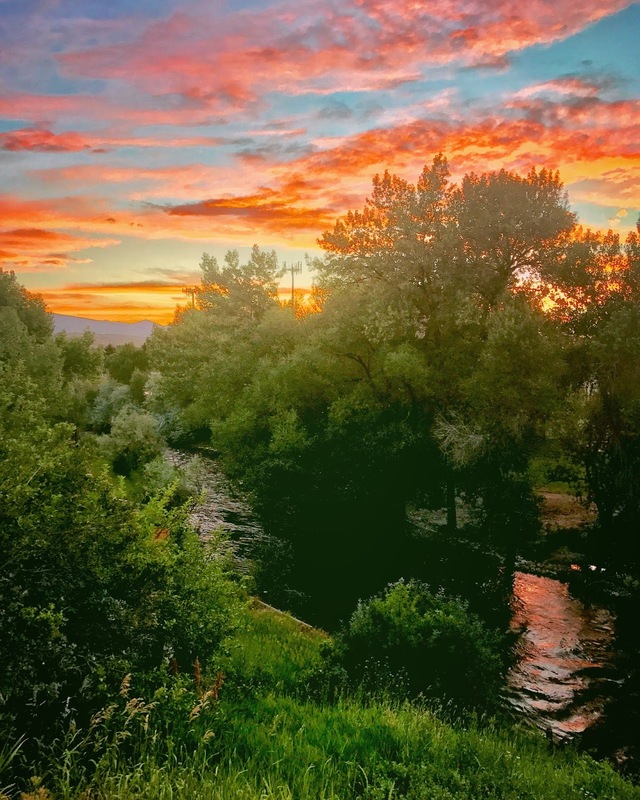 First stop was Lander, Wyoming in the Wind River Range mountains. ^We drove a good five hours or so from Ogden to Lander the first day and were greeted to our hotel room in Lander with an amazing sunset view over the Popo Agie River. 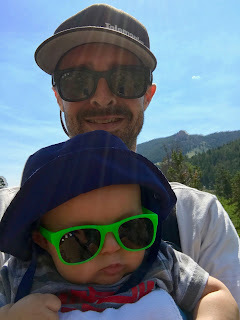 We made plans for breakfast in town and a hike the next day up in the higher elevations of the very same river to give the kids and dog a break from the road and stretch our legs out. ^After a delicious breakfast on the outdoor patio of The Middle Fork, a quant cafe in Lander, we hit the trail on the Popo Agie Falls Trial. 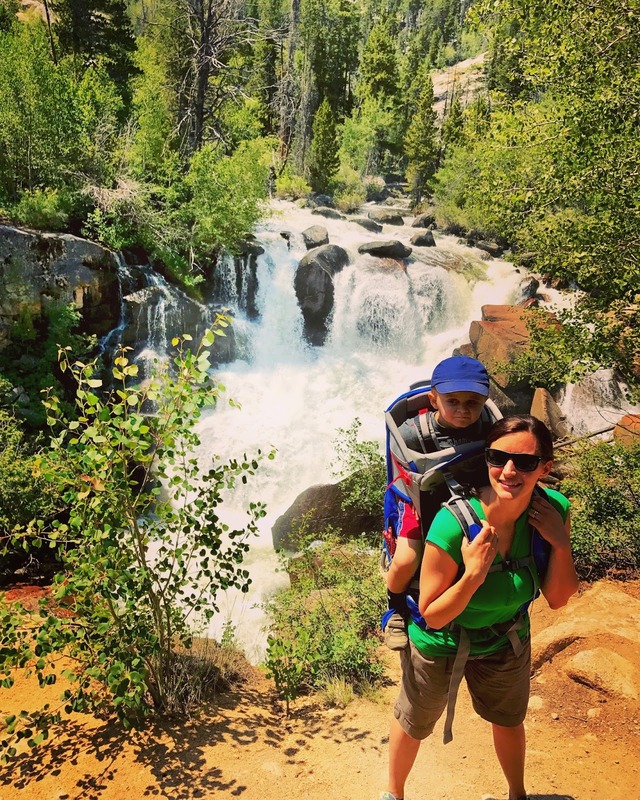 My youngest son, Walt, is just a little guy, but he is as happy as a clam riding in a carrier on my chest with stunning views of the rushing river and the Wind River Mountain Range above. 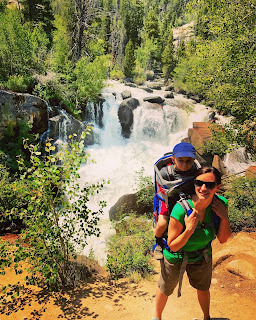 ^Christine and our elder son, Amos, posing for me in this picture above overlooking a section of Popo Agie Falls. The hike was awesome. The passers-by were delightful and kind, and we throughly enjoyed the hike. ^Everyone was tired out after the hike, and we slept hard in our Lander hotel room that night. The next morning we were back on the road for a travel day with our destination being Wall, South Dakota and Badlands National Park. ^It wouldn't be a road trip without a token fast-food picnic behind an O'reilly Autoparts store somewhere along the road. Christine and I had a few good laughs at the scenario we found ourselves in eating french fries and chicken nuggets next to the gas meter. 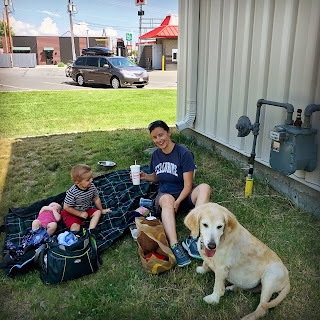 In our defense, we had our dog with us, needed some fresh air, and there was very little shade anywhere else but next to the gas meter behind the autoparts store next door to the McDonald's. We thought it was pretty hilarious! ^We were once again greeted to our hotel room with a beautiful sunset. This picture of it over Wall, South Dakota was complemented with some local gathering action at the neighboring rodeo grounds near our hotel. I couldn't help but feel like it was a little slice of Americana that I needed to snap a picture of. I grew up in the countryside so all things farm life always make me a bit nostalgic. 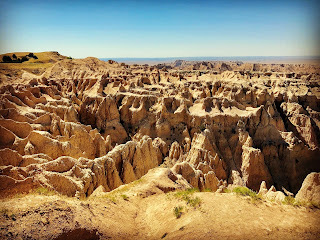 ^The next day we toured Badlands National Park. As with most National Parks our dog, Murphy, was a bit of an issue of us within the park. Wall did not have any doggy daycare establishments so ew had to bring Murphy with us. 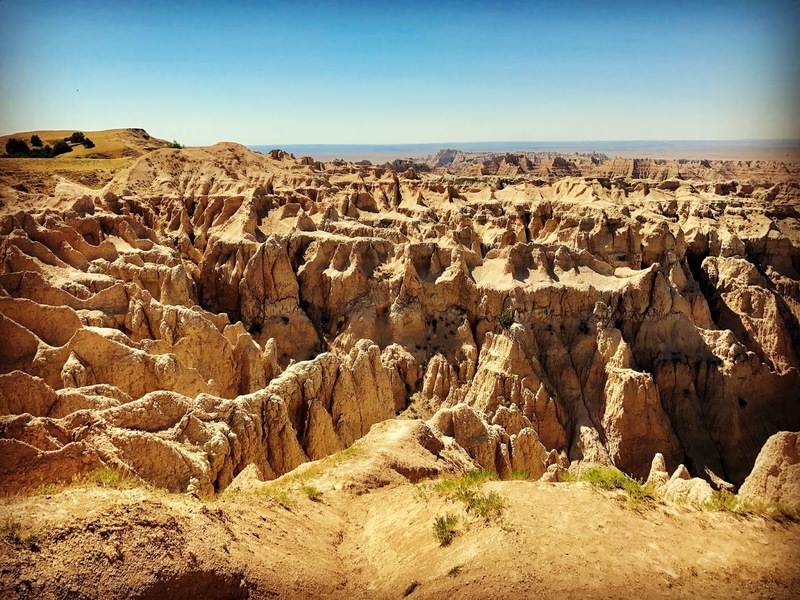 As such, our ability to really dig into Badlands National Park was limited. However, none of us had ever even seen it before so a limited tour of the Park was better then none at all. I would've rather gotten the kids out of the vehicle for a bit more, but it was also pretty hot that day too so we couldn't have gotten too deep into the Park anyhow. 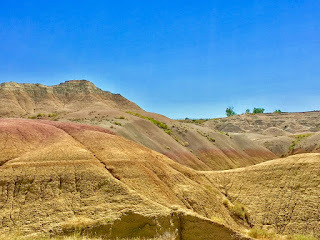 ^After the Badlands we had a day and a half's drive to make it back to our hometown. Incredibly we arrived to a hometown amidst a "100-year flood" were many of our family and friends were in a real life struggle with the local rivers and lakes after a series of torrential downpours in the area. 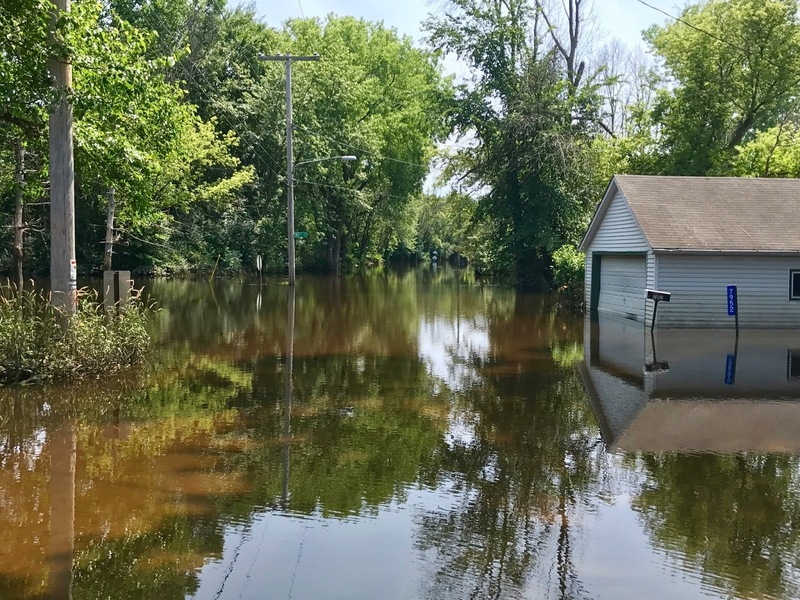 The river was at its highest at seventeen and a half feet above the typical flood stage. The effects were very destructive for a lot of people there, but thankfully no one was killed. As we drove into town we passed lines of National Guard vehicles as they trucked supplies and support into the area. It was kind of surreal to see a military presence promenading into your hometown. In this picture above I am looking down the road at a family friend's house as we emptied out what belongings they could salvage from their unsalvageable house so they can move into a different home in another, drier, part of town. It was heartbreaking to walk back and forth across the sopping carpet in their home as the waters receded enough to finally get in there to grab the few things they couldn't in such a hurry during the torrential downpour that brought the river behind their house into their home literally almost overnight. The waters did recede pretty quickly once the weather cooperated and local dams could relieve the pressure. After helping with the moving I was able to get to work checking out the local outdoor recreation that I want to promote and support with my new website and guide service. 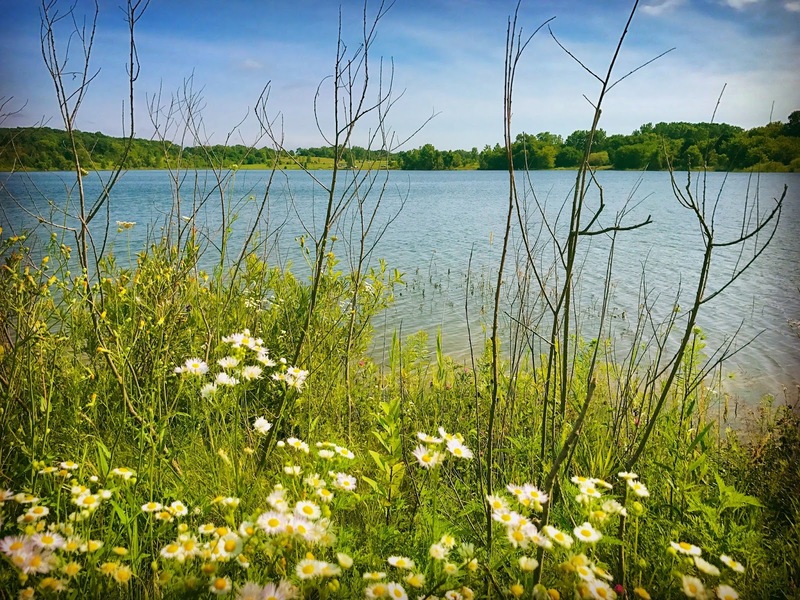 ^First opportunity landed me at the relatively new KD Park in the western part of Kenosha County in just east of the popular tourist town of Lake Geneva, Wisconsin. When I was a kid this park was a gravel quarry, and a few years ago the Kenosha County Parks department transitioned it into this beautiful park. 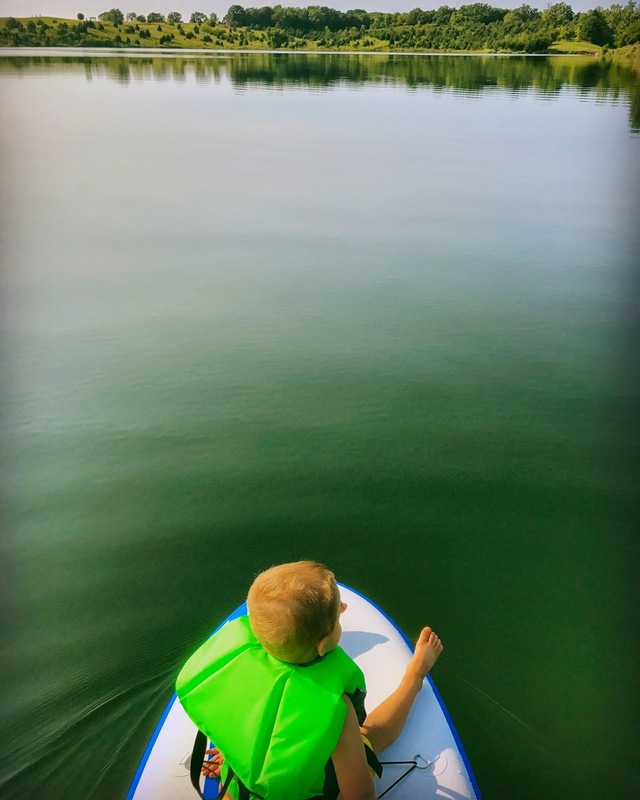 ^The non-motorized lake is perfect for a cruise on a stand-up paddle board, canoe, or kayak. 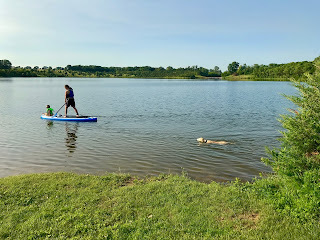 In this picture Christine and Amos paddle the glassy water as Murphy chases behind and Walt and I watch from the luscious green grass of the humid climate landscape. ^Then I took Amos out for a spin. ^The Park is also littered with hiking trails surrounding the lake and throughout the woods and hills of the Park. I had seen KD Park from the road a few times in prior visits home, but this was the first chance I really had a couple days to dig deep into it. I am super impressed and really excited to see how it continues to develop. I know I can promote a spot like this pretty easily when it is as naturally beautiful as this. ^Next I went to check out the new single track mountain bike trails at Silver Lake County Park, also in western Kenosha County just east of Lake Geneva. There was very little mountain biking here when I left as an 18-year old kid for college in Utah. 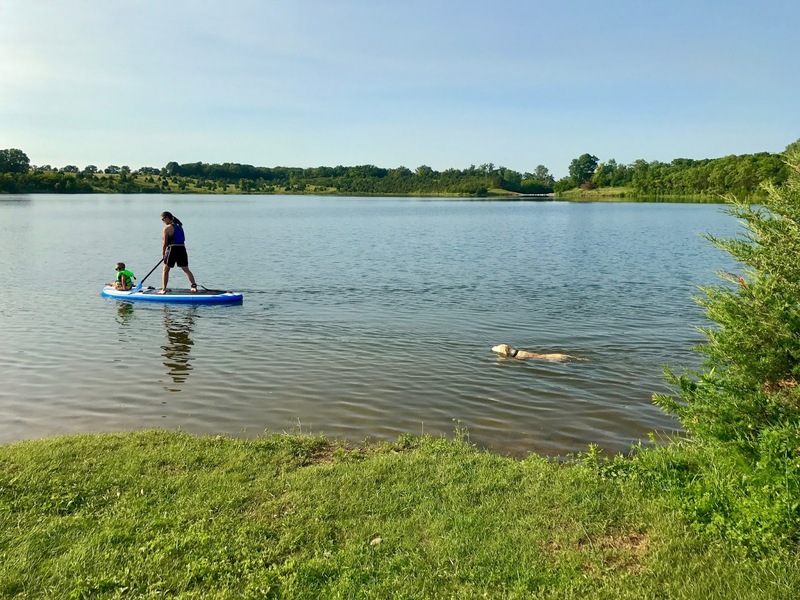 Then just a few years ago this group of local volunteers organized and the folks in the Kenosha Country Parks department again made a move to facilitate the fast-growing outdoor recreation that a lot of people are beginning to love in the area. The group is now organized as the Silver Lake Trail Riders and are a member of the Southeast Wisconsin Trails Alliance an I.M.B.A chapter. They built and maintain these trails and I for one was not only impressed, but am totally pumped on what I rode out there. 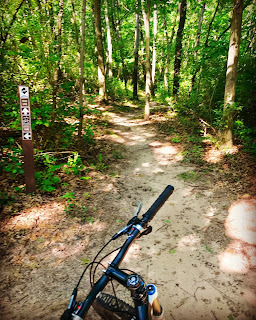 I used to dream of having legitimate mountain biking in the hometown as a kid, and even though I am not a kid anymore I am so glad it is here. I am also grateful that my kids will have the chance to grow up riding here. I ran into one of the organizers in the parking lot. I could not have gushed all over him more. I kind of laughed as I drove away that I may have overwhelmed him a bit with my enthusiasm, but I am just so excited about what they have done. There is even a brand new mountain bike racing team at the local high school now that is competing around the state. I am so pumped! I hope to help the team raise some money and support at the very least. ^Then of course is the family. This is my grandpa Don giving me some home building advice as we sit out on his screened-in porch sipping ice-cold Boxer beers. The people are the real reason we are making these plans and moves. 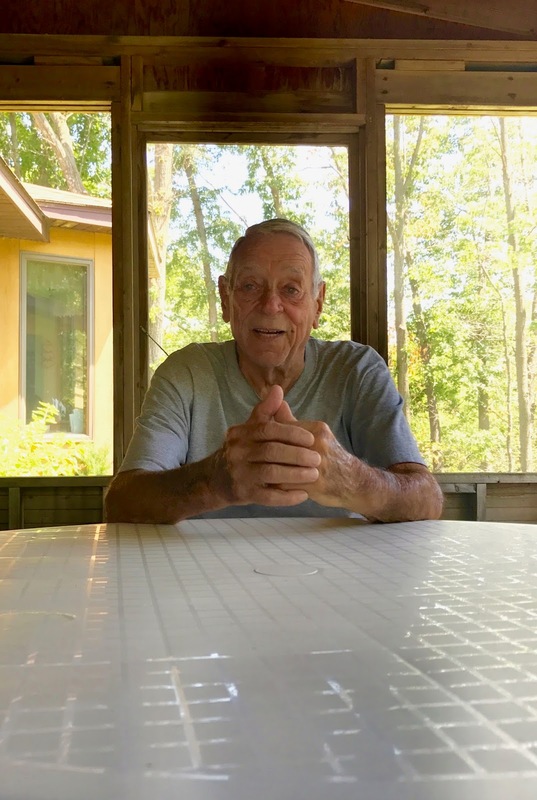 I am so thankful to have this time with him as he is my last remaining grandparent now. The whole journey is built around bringing my young family closer to both my wife and I's families and friends in the hometown. Also, after Amos' cancer battle it hit home for us harder that it does in fact take a village to raise a family and there was one very special village that we had in mind for that role. I am so happy to be able to have this opportunity to have the best of things in this world in a wonderful family, a fantastic hometown, and a life pursuing the work that I love to do in big mountains as well. Its not going to be the easiest transition for me personally, and will require even more travel for me in the winter after next year. 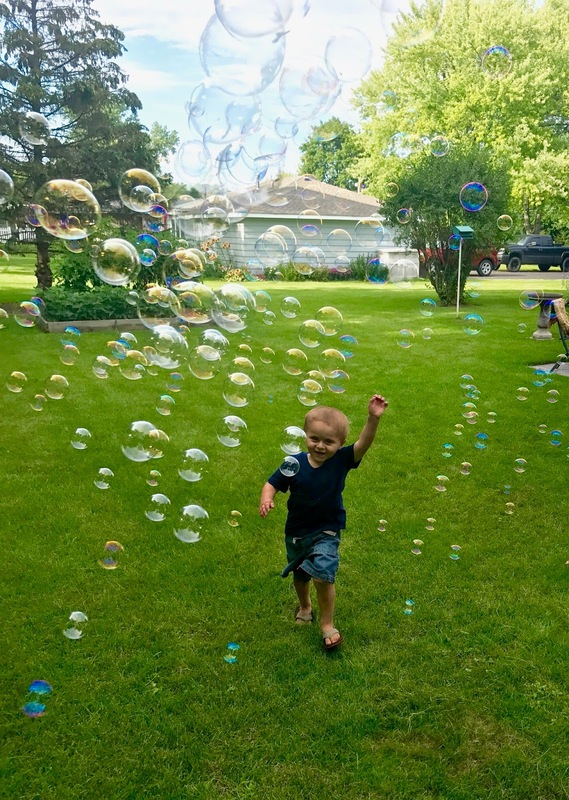 However, to see my son Amos as happy as he is spending time with his Nonni, Grandpa, Papa, Uncles, Aunts, cousins and all our life-long friends' kids is such a gift. 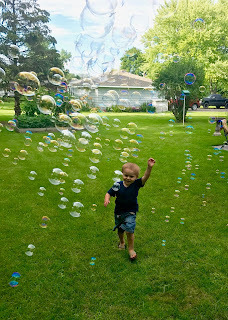 To watch him chasing bubbles in my father's backyard brings a joy to my heart that makes me so happy that I would take on any journey to be able to do what I love and also see all the people I love so happy in each others company in the hometown that raised Christine and I. I am blessed to be able to have a chance to do both, and I for one plan to work tirelessly to pull it off.